FROST KING® ALUMINUM DOOR BOTTOM 1-1/4 IN. X 36 IN. Full 1-1/4" Width Covers Even The Largest Under-Door Gaps. Sturdy Extruded Aluminum with Locked-In Flexible Vinyl Leaf. For Wood Or Metal Doors. Slotted Holes For Easy Adjustment. 36" Long. 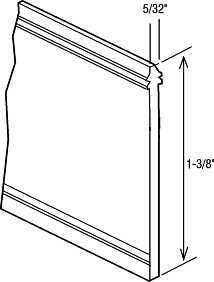 FROST KING® DELUXE DOOR BOTTOM WEATHER STRIP 36 IN. SHOWER DOOR SEAL GRAY 36 IN.